Here are this week's stories for a kind reader's perusal, should you have a spare moment. 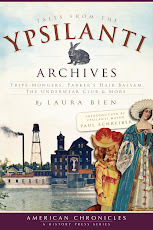 Relive the sordid history of the Ypsilanti Condiment Company. In the Archives: Story Makes Full Circuit. ...and with that, Dusty D is off to bed, thoroughly tuckered out by plant sale prep at Growing Hope today. See you tomorrow! "Attached are copies of Thorn/e School on Textile Road. I really don't know much about it. 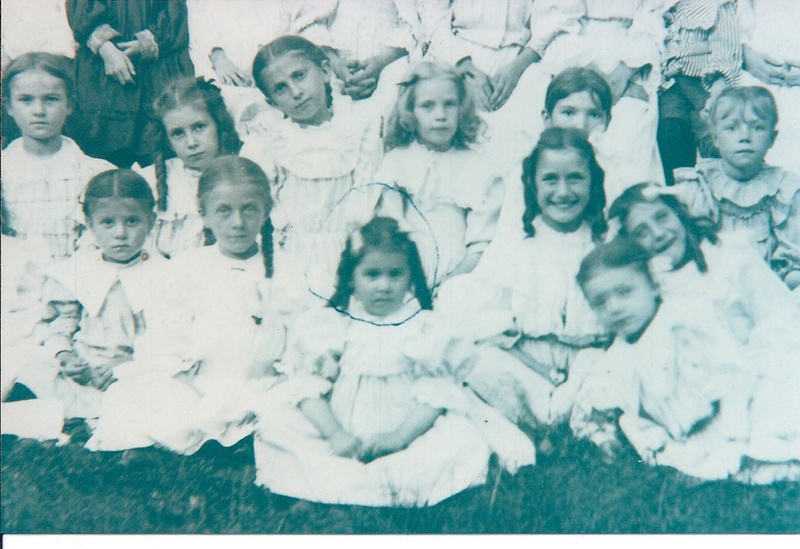 My notes say it was a German religious school." "The close up of the circled little girl [below] is Selma Wiederhoft, sister of Bertha Wiederhoft. 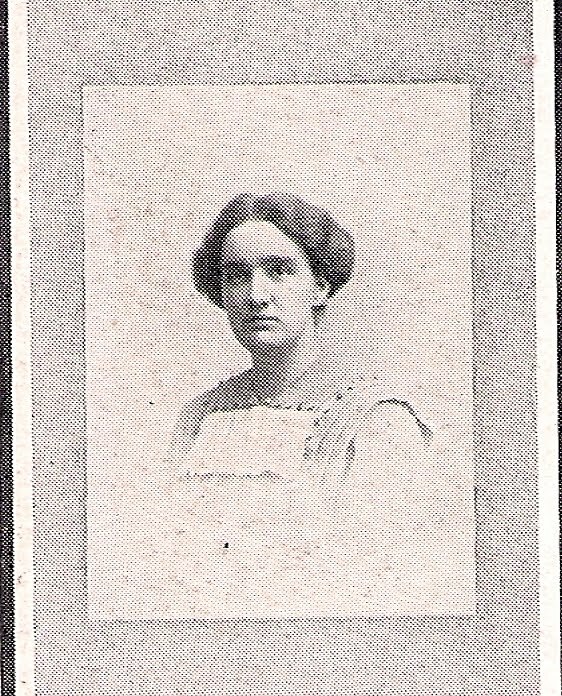 She was born in 1891. 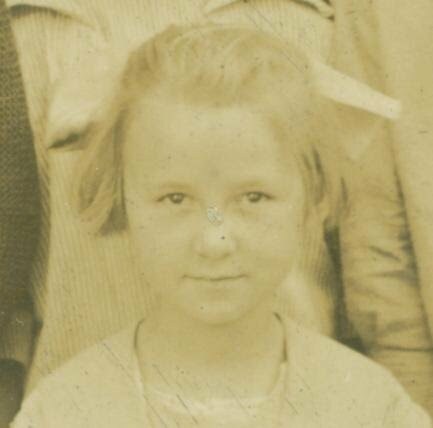 If we assume she is about 5 years old, then the photo dates from about 1896. Her younger sister Marie was born in 1892 and is not in the photo. Not sure what age children started attending school back then." 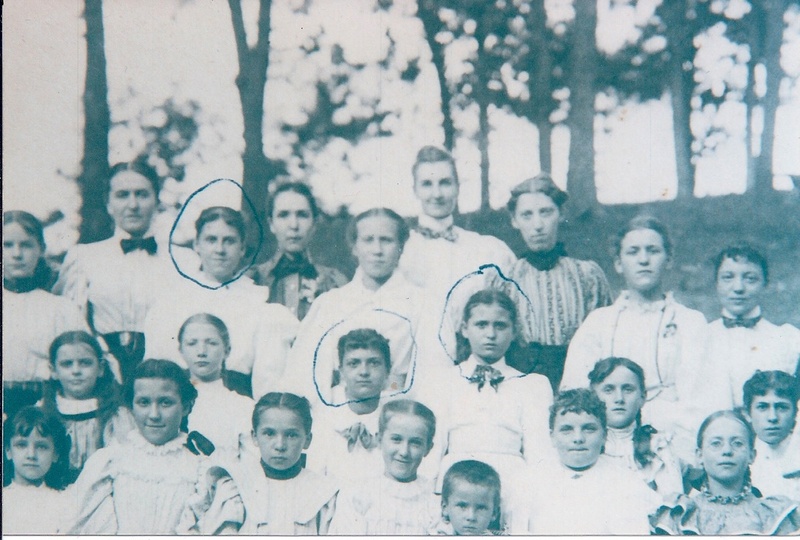 "The other close up with three girls circled [below] are: left: Ida Wiederhoft born 1883 married Theodore Hand; center Anna Wiederhoft born 1885 married Herman Roggenkamp; right Bertha Wiederhoft born 1886 who married Herman Kruger." "Minnie Wiederhoft born 1888 is the child circled about 3 rows behind Selma in the front." "I would really like to learn more about the Thorn/e School. Was it only for German children or did others attend. How long was it open?" Dusty D does not know, but hopes other readers do. 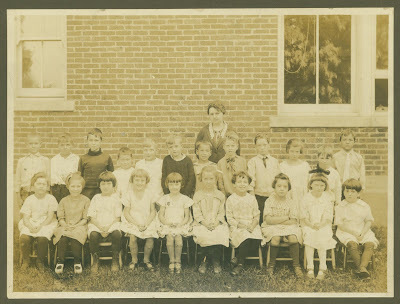 I'll take a look in the Archives this Saturday--our index says we have enrollment info from 1909-1927. 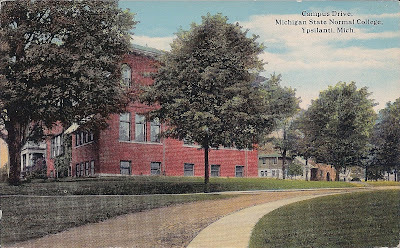 Campus Drive, State Normal College. A pleasant note from Peter D. Martin who now lives at Coronado, Cal., renewing his subscription to the Ypsilantian for another year, suggests that he will not be allowed to compete in the Calla contest, but he is mistaken. The challenge was to the world, and his calla is admitted with a certified height of 6 feet. He says that callas bloom in that far away state all winter. He says also that the past winter has been the pleasantest he has spent there, there having been no frosts, and only 1/2 ton coal necessary to keep them warm. He slyly hints that these good times have come under Cleveland's administration, but doesn't say he's converted to his way of thinking. --Item from the April 25, 1895 Ypsilantian newspaper. 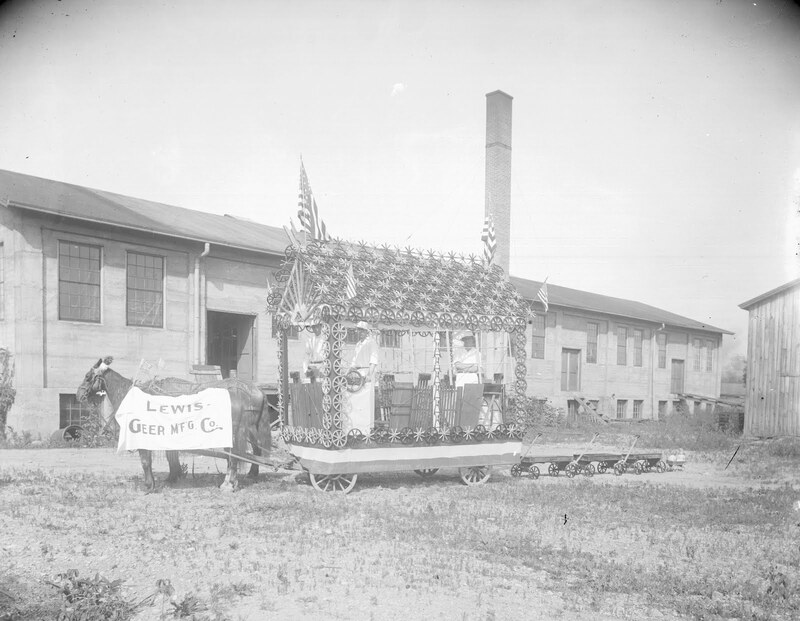 (Click for larger image) The Lewis-Geer company operated in what some now call the grey "bus garage" on Railroad Street. This is the company that built that building, in 1909. 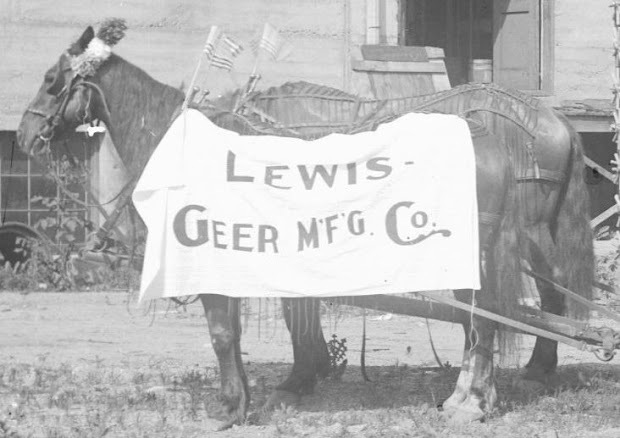 Lewis-Geer made several different models of porch swings, coat hangers, sleds, and, as you can see here, wagons. This looks like a Fourth of July float the company made. Here's an April 9, 1910 Ypsi Press article about the business, in the spring after it started up. One hundred and one years ago today the Ypsilanti Daily Press front-paged a big story: the construction of the Masonic Temple (now Riverside Arts Center) was complete--its cornerstone had been laid just a year earlier--and it would open with great fanfare on April 21. "The temple is doubtless the finest ever erected in the down town section of this city," said the paper. "The $10,000 [$231,100 today--what pittance was a small-m mason earning in 1910?!] which it cost will be paid for in cash. It opens the first public auditorium in the city and furnishes a ballroom suitable for receptions, dances, and other social affairs of either a public or private nature." On the first floor were 2 parlors, one used by anyone renting the auditorium and one used by the Order of the Eastern Star, which at that time was the ladies' auxiliary of the Masons, though it's co-ed now. On the second floor was the main Masonic lodge room, "done in blue and the dark rich brown of polished oak." The blue carpet alone cost $500 [$12,000]. "Surrounding the lodge room are an abundance of preparation rooms, regalia closets, retiring rooms, robing apartments, etc. On the third floor is the armory [armory? what? guns?] the storeroom and several smaller chambers which may be used for a variety of purposes." An elaborate program with a banquet, music, and dancing were planned for April 21. Visitors could also try out the billiard and card-playing rooms. --A fraternal order--not a corporation, not a business of some sort--up and built itself its own huge building, presumably raising the $231,100 itself. --What were the builders paid if they could build it this cheaply by modern standards? --How influential were the Masons within Ypsilanti if the city OK'd their building their lodge on a huge footprint just a hop from downtown? 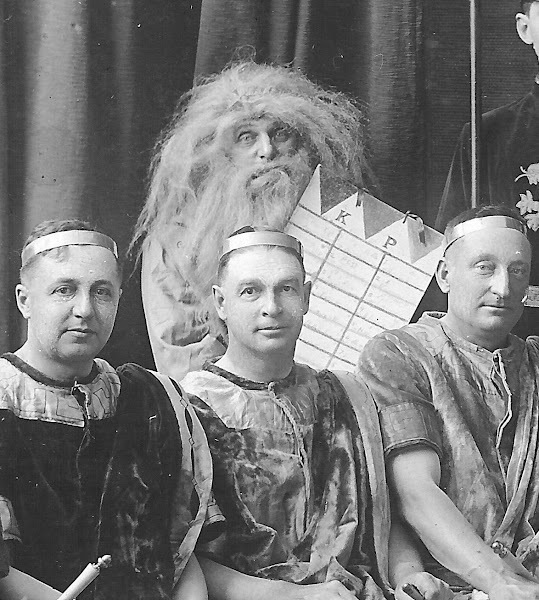 --A lot of Ypsilanti men bought into the elaborate rituals and secrecy of the fraternal order. Or at least joined this group. Why? Belief in the rituals? Networking? Getting out of the house and away from the wife, hanging with bros? Eating something better than the wife's cooking? --There are still a few Masons who meet in a little lodge just south of Ypsi. They're all rather old. Why doesn't this order appeal to anyone seemingly under 60? It's a huge shift in (white) Ypsi culture from a hundred years ago when the Masons, the Knights of Pythias, the Oddfellows and other popular fraternal groups were very active; I'd like to know why this is so. The story itself (a grainy microfilm copy) is below; click twice for full view. 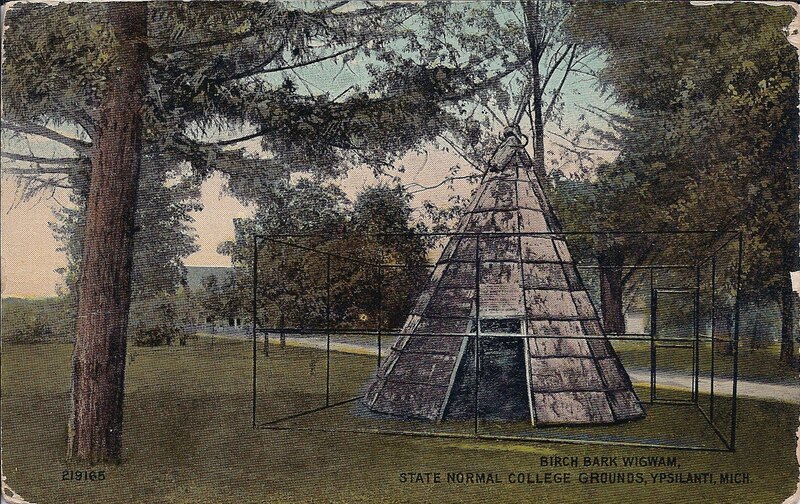 Birch Bark Wigwam, State Normal College Grounds. 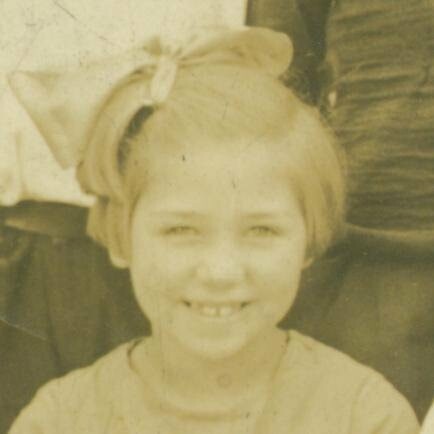 This photo was stored electronically at the Archives on the main computer. When I first clicked on it, not knowing what it was, the image filled the screen and freaked me right the heck out--stark, candid, strange. But who was the woman on the left? Could she be found? The photo file name is loomis,alta_friend.jpg. 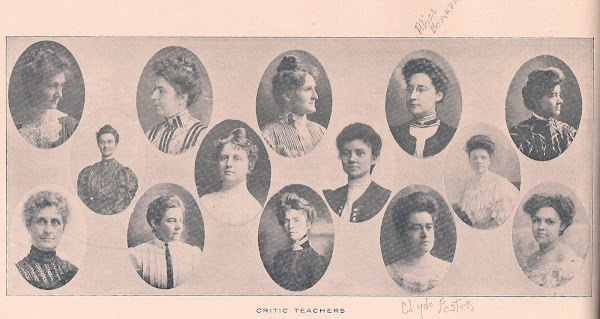 Was Alta Loomis the name of one of these women? 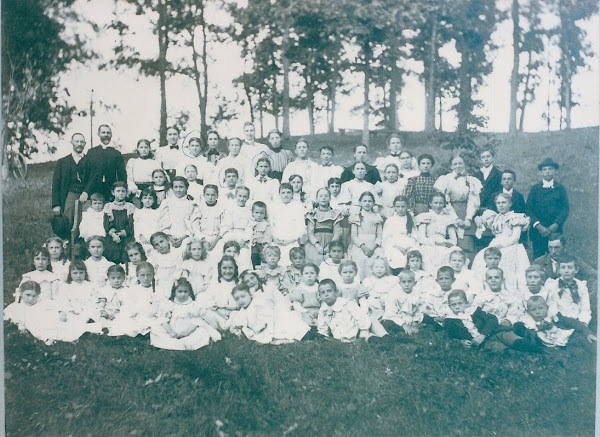 A census search for the years 1880-1920 (I guessed by the clothing that this photo was from the early part of the 20th century)--and found 2 Alta Loomises, one in Muskegon and one in Ionia. Ionia's not that far...was Alta related to Ypsilantians? Otherwise why would the Archives have this photo? 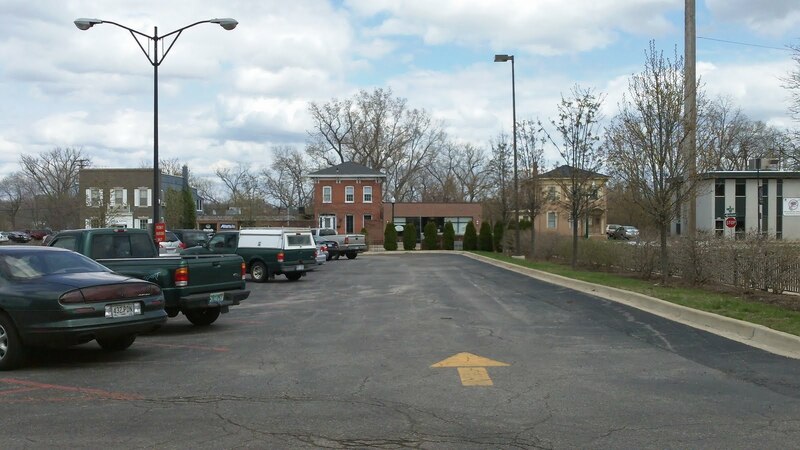 Then I simplified the census search to "Loomis" in Ypsi and found several Loomises. No Alta. I took a look in the 1905 city directory. 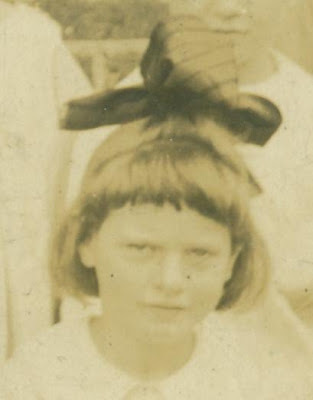 Wait--there was an Elta Loomis, "teacher." Grade school? High school? Perhaps the Normal School? And the address, 706 Emmet, at which she was boarding was the same as "Loomis, Miles," a traveling salesman, and his wife Mary. 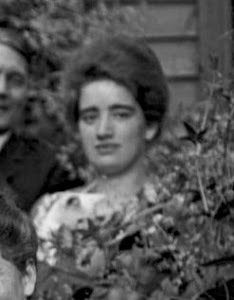 Were Miles and Mary her parents? I looked in a 1907 yearbook from the Normal School. Loomis...Loomis...aha, there was a L. Loomis next to...drat, a composite photo with many faces. The names weren't keyed to the various portraits. 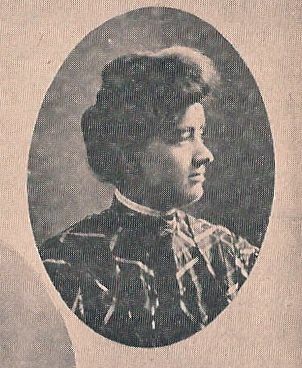 Two of the portraits had been annotated with "Alice Boardman" and "Clyde Foster" in a script I recognized as that of former city archivist Dorothy Disbrow, who retired in 1980. Back to the 1910 census to look for Miles and Mary. 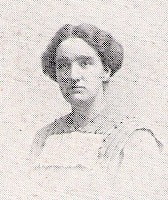 There they were in the 1910 census: Miles, Mary, and "Lulu E.," who was listed as a teacher at the Normal. There you are, Lulu. Or was she? Which woman in the initial photo was Lulu Elta Loomis? The picture in the 1913 yearbook was only an inch wide. I took off my glasses and studied her features up close...but her picture was too tiny to be able to get a fix on her features. Magnifying glass. I remembered I had another photo labeled "Loomis Group 2." 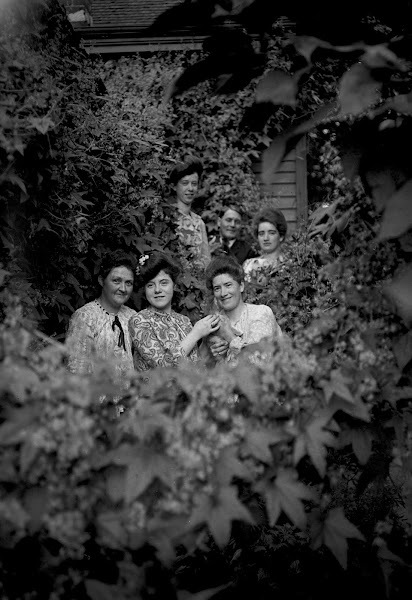 Perhaps she might be pictured there--assuming that the five women in the photo were all Loomises. Wait, what about this woman? What a beauty. Was she the same one as in the 1913 yearbook? It seemed so! Back to the composite photo. The facial features seem to be the same...plus an indefinable look of mingled melancholy and mirth in her gaze across all of the photos. 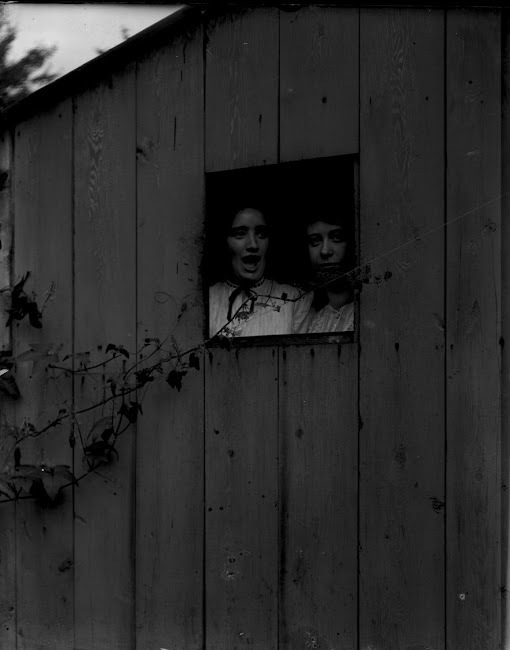 Is this the woman in the window? A last bit of sleuthing reveals that Lulu was born in 1883. 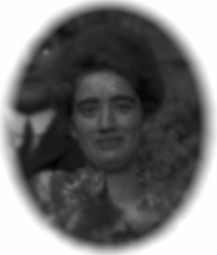 On September 4, 1913, at age 30, she married physician David Lewis Dunlap in Ypsilanti. 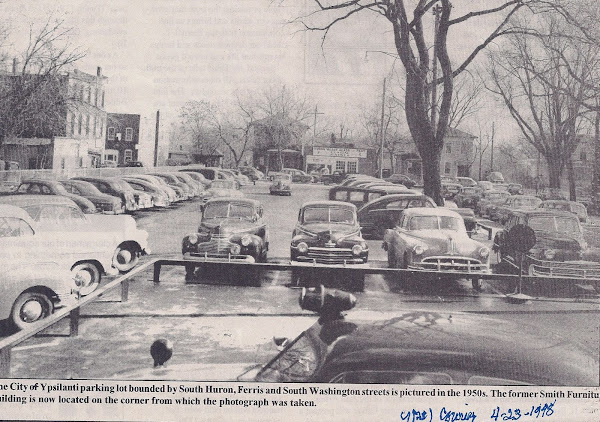 By 1930, the couple lived in Wayne County's Highland Park. David was 52 and Lulu was 46. She had 4 children: 15-year-old Ward Comstock, 14-year-old David Bruce, 13-year-old Gregg Loomis, and 6-year-old Jean Dean. 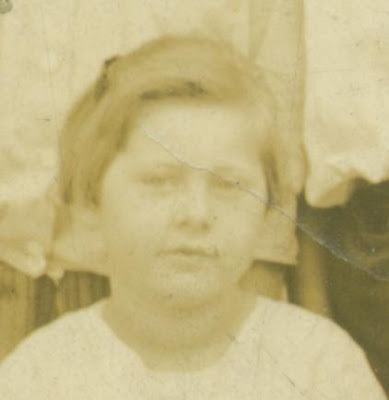 Lulu's widowed mother Mary lived with the family. Lulu would outlive David, surviving until age 89. She died in 1972. 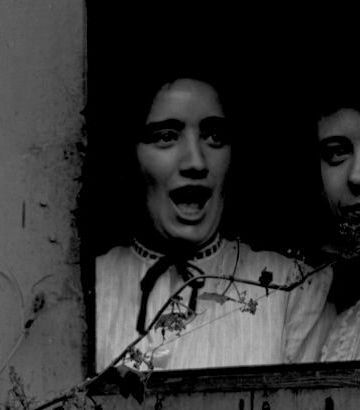 Many years earlier, she had been a beautiful young woman laughing with her friend. 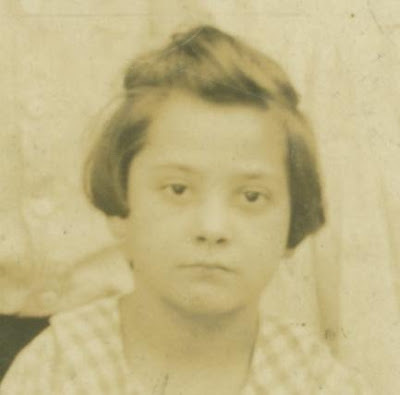 She never guessed that her expression of meditative suppressed humor would be, a century later, a thing of mystery and wonder. A WELL_DRESSED YOUNG MAN named Geo. M. Smith was about the streets last Friday offering gold (?) spectacles for sale for 50 cents [$13 today], claiming he had found them. He was soon arrested on the charge of peddling without a license and in default of payment of $5.75 fine [$150], he was given 15 days at Ann Arbor. Marshal Ross discovered $6.50 on the fellow when he searched him. --Item from the April 18, 1895 Ypsilantian newspaper. 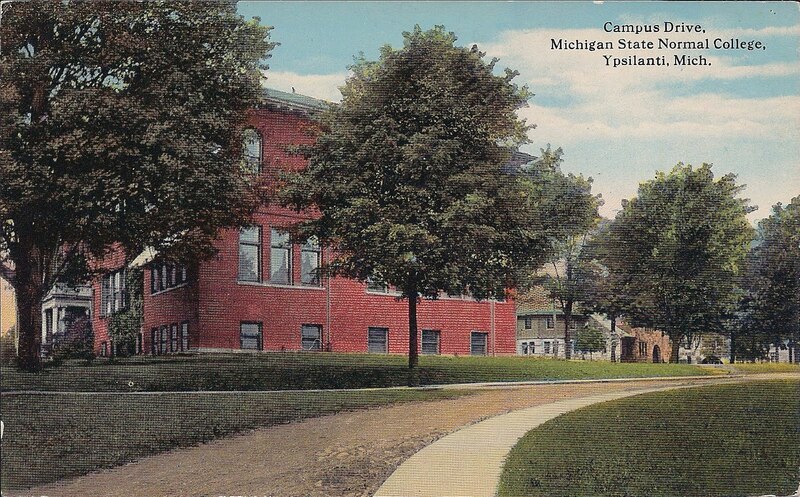 Ypsilanti volunteers never saw action in the Spanish-American War, arriving in Cuba after hostilities had ceased. 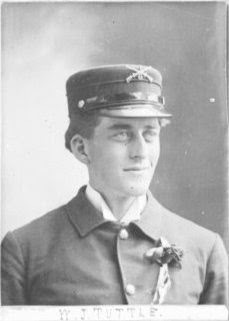 Only one member of Company G, the majority of whom consisted of Ypsilantians, was lost: corporal Guy Loyal Tuttle, who died on July 27, 1898 of illness in Camp Thomas at Chickamauga in Georgia, where sanitation was poor. Guy was the son of farmer and Civil War cavalry soldier Nelson Tuttle. Guy's middle name came from his grandfather, Constant Loyal Tuttle, the son of Revolutionary soldier Ebenezer Tuttle. Guy's body was returned to Ypsilanti and is buried in Union-Udell cemetery. Wilbur J Tuttle was Guy's cousin, the son of John C Tuttle who was the son of Constant Loyal. Everett Wiard was the third son of George and Ann Wiard. George was the son of Lyman Wiard, who arrived in 1826 and bought 80 acres just east of town that formed the basis for a multigenerational apple orchard/cider/vinegar business. 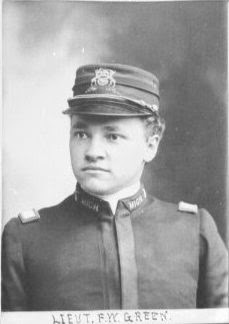 The commander of Company G was U-M law school graduate Fred Green. 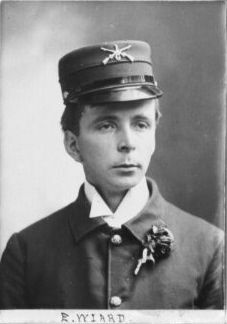 After the war, he remained active in the National Guard and served as city attorney. Around the turn of the century he went into business, becoming partner and then owner of the Ypsilanti Reed Furniture Company, which in 1903 moved to Ionia in order to use prison labor there. Fred later ran for and won first the mayorship of Ionia, an office he held for fourteen years, and then governorship of Michigan, serving from 1927 to 1931. 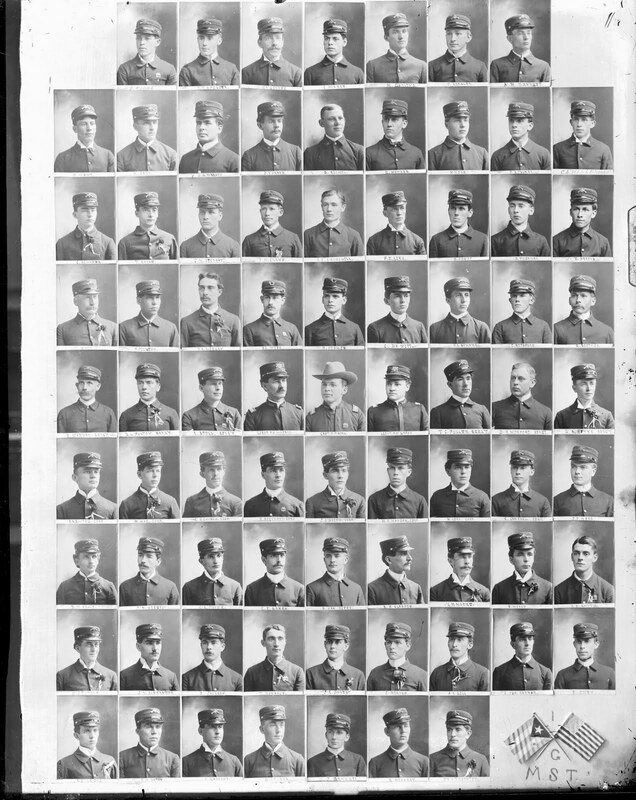 The company portrait, in omitting Guy Tuttle, probably was taken after the men returned home (click for larger image). 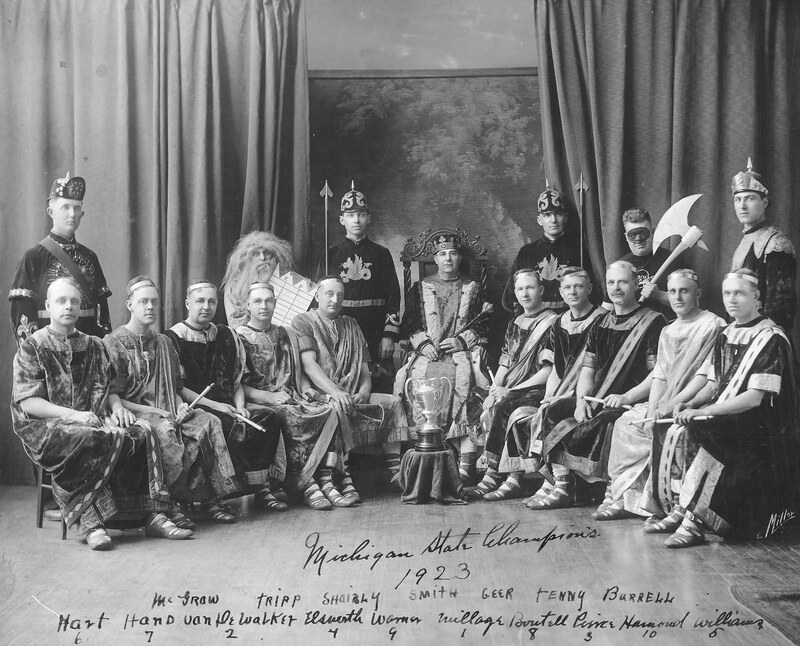 Ypsi's Knights of Pythias was one of many fraternal groups in town. Others included the Masons, the Oddfellows, the Maccabees, the Phoenix Lodge, the Ancient Order of United Workmen, the Elks, the Catholic group the Knights of Columbus, and so on. 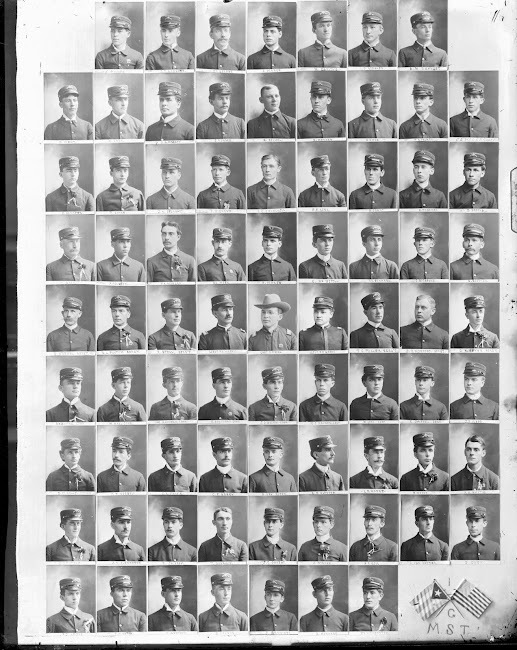 Many Ypsilanti men were members of more than one group. 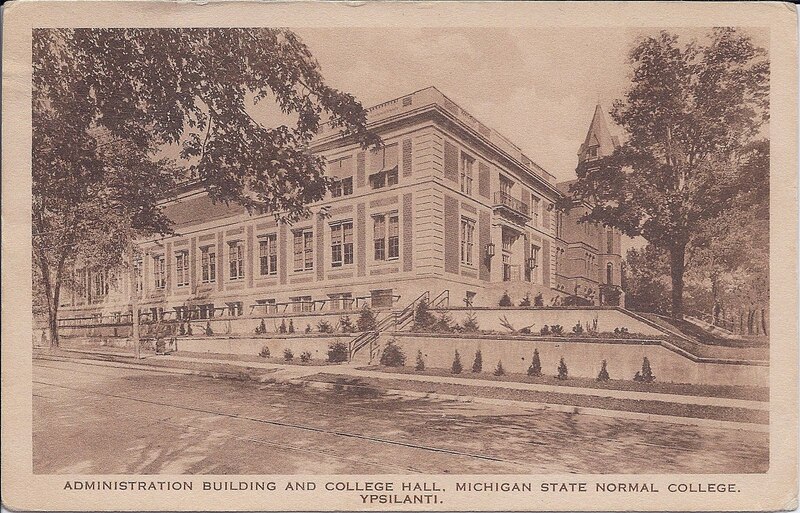 In Ypsi the Masons, the Oddfellows, and the Knights of Pythias among others had their own dedicated lodge meeting hall. 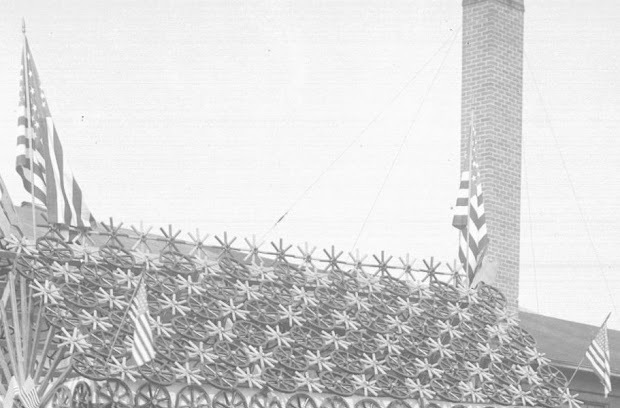 You know where the Masonic one was; the K of P's was on the third floor of the old bank building at the southeast corner of Michigan Ave. and Huron (now City Hall). They met twice a month and shared the space with the Oddfellows. The K of P was nationally founded in 1864. Wikipedia: "It was founded by Justus H. Rathbone, who had been inspired by a play by the Irish poet John Banim about the legend of Damon and Pythias. This legend illustrates the ideals of loyalty, honor and friendship that are central to the order." Pythias, according to Greek legend, was a guy sentenced to death who asked to return home one last time. Dionysius [EDITED TO ADD: A king of Syracuse, not the god] granted his wish provided that he be chaperoned by Damon--and that if Pythias fled, Damon would be executed in his place. The day for Pythias to return came and went, and Dionysius was about to kill Damon when Pythias showed up at the last minute, saying that his ship had been delayed. Dionysius was so impressed by Pythias's loyalty that he pardoned both men and hired them. Which may explain the vaguely Greek-ish dress of the group pictured here...but perhaps not the weird wildman pictured in back left. I'd like to know the story behind that. 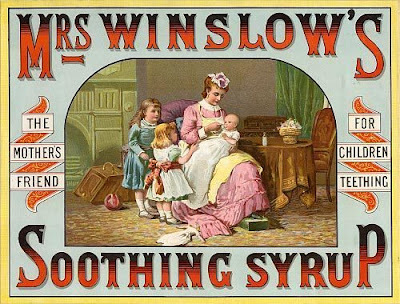 Click for full image. 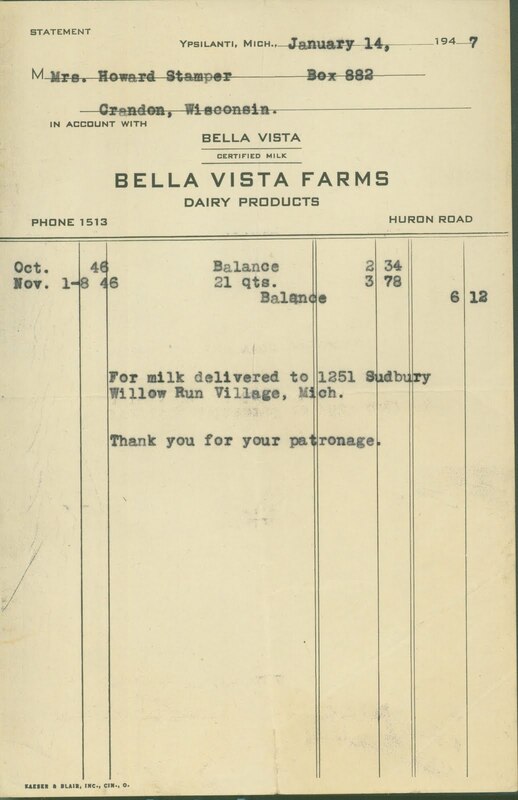 These two notes suggest that Willow Run had at least one milkman servicing the complex. Note how polite the yellow note is! 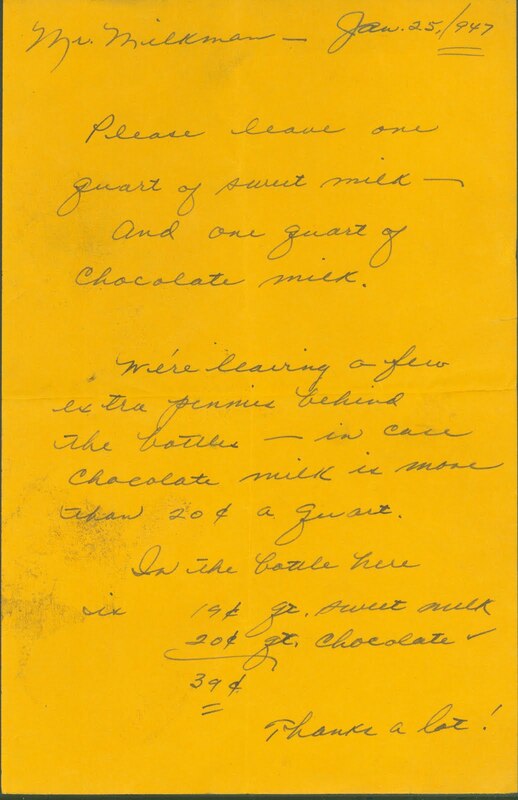 You can't quite see it on the note, but it has four creases indicating it was at some point folded in half and then half again, perhaps to insert in the top of a milk bottle? 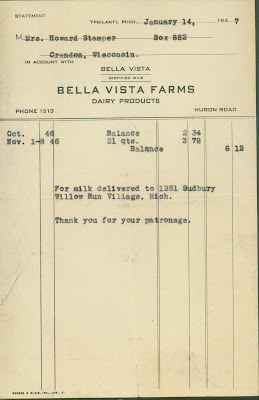 Please leave our quart of sweet milk--and one quart of chocolate milk. 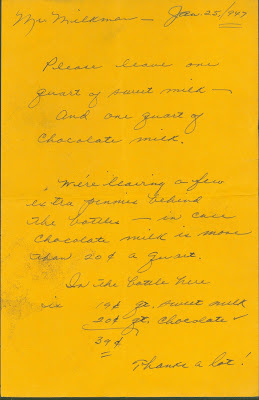 We're leaving a few extra pennies behind the bottles--in case chocolate milk is more than 20 cents a quart. The onetime Administration Building and College Hall. 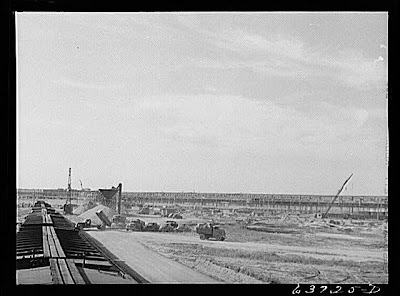 A photographer perched on the catwalk on top of a nearby train overlooks the groundbreaking of the bomber plant. Click twice for full size image. "A kinetoscope, one of Edison's latest inventions, was on exhibition last Friday at the Hawkins house. It is a wonderful machine and reproduces motion. This one reproduced a four round prize fight." "The musical program to be given at the Young Women's Christian Association Friday evening promises to be very fine." "An employee of the Singer Sewing Machine Co. with an unpronounceable name has turned up missing after having sold a couple of machines and failing to turn over the proceeds, $75 [$1950 today]." "Another calla is reported which measures forty-two and one-fourth inches from the ground to the tip of the spathe. The plant has had a little dilute ammonia water occasionally throughout the winter, but no other fertilizer." "FOR SALE. I have a quantity of early White Evart Potatoes which I will sell for seed. Residence 1 mile east of the southwest corner of the township of Salem." WM. H. HARRISON." "The correct thing in calling cards and note paper at the Bazarette." "The Cleary College base ball team has ordered new suits." 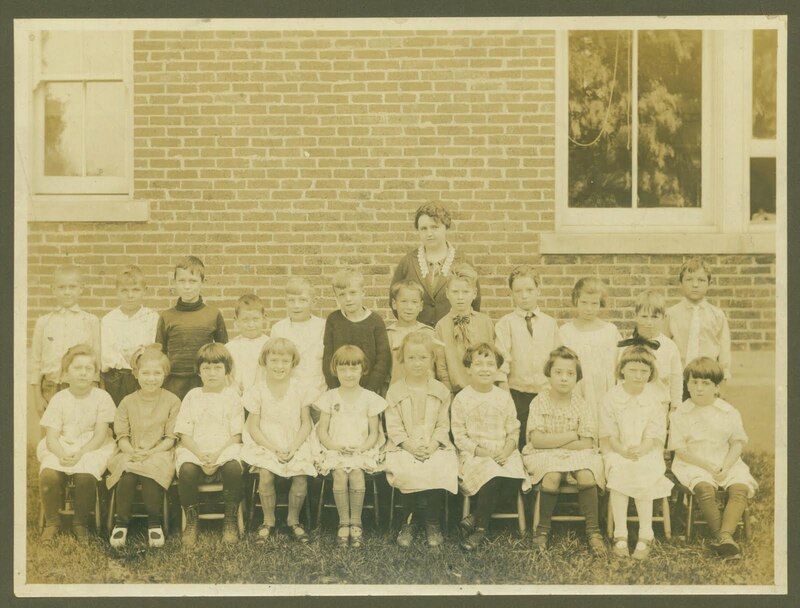 The Little Girls of Woodruff School, Ypsilanti; c. 1930?